Unrehearsed Returns to Scotch Tape! – Unrehearsed Shakespeare Co.
May 25, 10pm, at the Playground Theater (3209 N Halsted St), Scooch Tap presents: Scotch Tape! Unrehearsed Shakespeare will be joining in the skylarking. 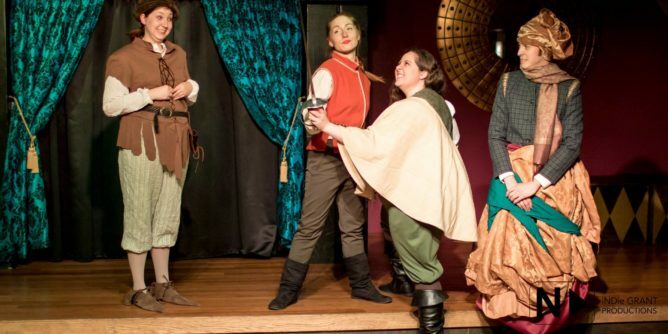 Pictured: Katy Crow, Gilly Guire, Alexandra Boroff, and Adrian Garcia in the 2016 world premier of The Wayward Women. Photo by iNDie Grant Productions.